Chelsea, Everton and Leeds United players are among the names to have made their senior debuts for their respective countries over the most recent international break. In the wake of the World Cup, a number of countries are looking to rebuild their sides and phase in a number of new players. We’ve taken a closer look at 13 players who all earned their first full caps in recent weeks. Chelsea supporters could possibly be forgiven for struggling to pick Emerson out of a line-up given the left-back, who moved to Stamford Bridge in a £17.6million move from Roma in January, has made just seven appearances for the club. The 24-year-old has failed to appear at all under Maurizio Sarri this season but that has not stopped Roberto Mancini handing the Brazilian-born player his first outing for Italy. 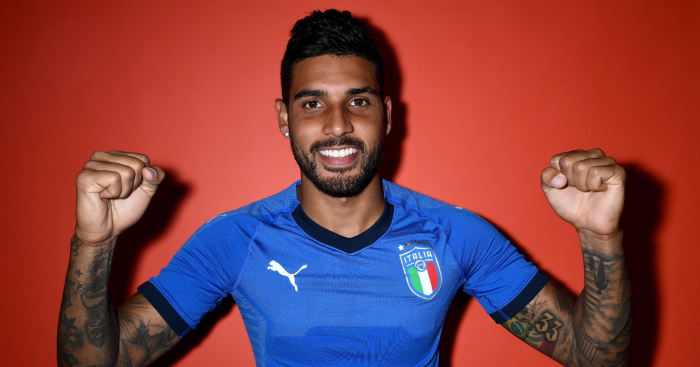 Having been previously been called up by Gian Piero Ventura, Emerson came off the bench for the final 15 minutes of Italy’s 1-0 loss to Portugal. He fared slightly better than another forgotten Chelsea full-back Davide Zappacosta, who failed to even make the bench. Another of Italy’s new caps, Lazzari’s remarkable rise has seen the right-back go from playing in Serie D five years ago – and Serie B as recently as 2017 – to a full international. The 24-year-old’s debut against Portugal meant that SPAL had more players in the Azzurri’s starting XI than Juventus, Inter and Napoli had combined. Alright, you guessed it, those three sides did not have a single representative in Mancini’s team. Much like Lazari, Biraghi has taken the long way around to the Italy side. Having failed to make the grade in two separate spells at Inter, the left-back has appeared for seven other clubs, including time in Serie B and La Liga. Biraghi has begun to flourish at Fiorentina, with Aleksandar Kolarov the only defender in the entire Serie A to create more chances and provide more accurate cross than the 24-year-old last term. Given Emerson’s lack of game-time at Chelsea and with Domenico Criscito now the wrong side of 30, there could be an opportunity for Biraghi to establish himself as Italy’s first-choice left-back. A substitute appearance against USA represented Richarlison’s debut for Brazil, and the Everton man marked his first start four days later in some style. Following France’s glory in Russia, Areola becomes the first player since Argentina’s Héctor Zelada in 1986 to win the World Cup despite being uncapped by his country. Sadly, the PSG goalkeeper won’t be able to repeat the feat in 2022 after he started and was named man of the match in the 0-0 draw with Germany. And to cap it all off, he also managed to kick his own crossbar in the following fixture, a 2-1 victory over Netherlands. Still just 21, Kehrer proved enough after breaking through at Schalke to earn a €37million move to PSG in the summer – a record deal for a German defender. Competing for a place in the Parisians’ starting XI with Brazil internationals Thiago Silva and Marquinhos, plus France’s Presnel Kimpembe, Kehrer has started just once for PSG so far. It was an unhappy occasion for the centre-back, who was hauled off at half-time with PSG drawing 1-1 with Angers, but he was given a boost by Joachim Low by being handed a Germany debut as a substitute against Peru. Having also operated at full-back and spoken about his desire to evolve into a holding midfielder, the youngster’s versatility could aid his cause for club and country in the future. What threatened to be a debut of nightmares turned into the international bow of dreams for Hoffenheim’s Schulz. The left-sided player was at fault for Peru’s opening goal but made amends for his error by scoring a late winner – admittedly with one of the ugliest goals of all time. The fallout from Mesut Ozil standing himself down from international duty has seen highly-rated Bayer Leverkusen prospect Havertz handed an opportunity by Germany, making a cameo appearance in their 2-1 win over Peru. Havertz has drawn comparisons to Ozil in the past and admits himself he would like to emulate the Arsenal playmaker. “I would like to evaluate this exclusively from a sporting point of view,” the 19-year-old told German website Spox when asked about the controversy surrounding Ozil’s decision. “To doubt his footballing qualities is incomprehensible to me. Spain are another country looking to undergo something of a rebuild after a disappointing World Cup. Luis Enrique is now in charge as manager and five players aged 23 or under appeared and impressed in the eye-catching 6-0 rout of Croatia in the Nations League. Ceballos made his senior international bow in that fixture, as the Real Madrid youngster continues to establish himself at the Bernabeu. Gaya was also handed a Spain debut against Croatia, and the opportunity is there for the Valencia defender to make himself his country’s starting left-back after Luis Enrique unceremoniously dumped Jordi Alba from his first squad. The 23-year-old reportedly attracted interest from Manchester United, Arsenal and Atletico Madrid in the summer but signed a new five-year deal at the Mestalla. Oliviera has had to be patient to establish himself at Porto, spending five loan spells away from the club before finally playing more consistent first-team football last season. The attacking midfielder’s displays earned him a place in Portugal’s preliminary squad for the World Cup, but he finally made his bow as a late substitute in the 1-1 draw with Portugal. Rhymes with Gelson Fernandes but is a 19-year-old who plays for Benfica and Portugal, not a 32-year-old who plays for Eintracht Frankfurt and Switzerland. Would never have guessed Eintracht Frankfurt, would you? An injury to Luke Shaw saw Chilwell handed a first call-up to England’s senior squad, and Gareth Southgate delighted Leicester supporters by giving the Foxes left-back a run-out at the King Power Stadium as the Three Lions beat Switzerland 1-0. Highly regarded among the Wales youth set-up for a number of years, Roberts began to attract attention when he made his Premier League debut as a 17-year-old for West Brom in 2016. The forward had to drop down to League One in three separate loan spells to play consistent football, earning a £2.5million move to Leeds United in January amid plenty of interest in his signature. After injury delayed Roberts’ Whites debut until this season, he is yet to establish himself in Marcelo Bielsa’s side, but made his senior international debut as a replacement for Gareth Bale in Wales’ 4-1 thrashing of the Republic of Ireland and again appeared as a substitute in the defeat to Denmark.